Poverty should be history… We’re helping make sure it is. Toynbee Hall is a community organisation with a heritage to be proud of. Having worked to reduce poverty and disadvantage in London’s East End for over 125 years, it has a great story behind it. It just needed a fresh way of telling it to a new audience. The organisation has seen great changes in East London over the last century. But despite the gentrification of the area in recent years, social inequality and wealth disparity are still painfully apparent. Unlike the neighbouring City of London, Tower Hamlets is one of the poorest areas in the country. So it stands that Toynbee Hall’s work is just as relevant now as when it was founded. 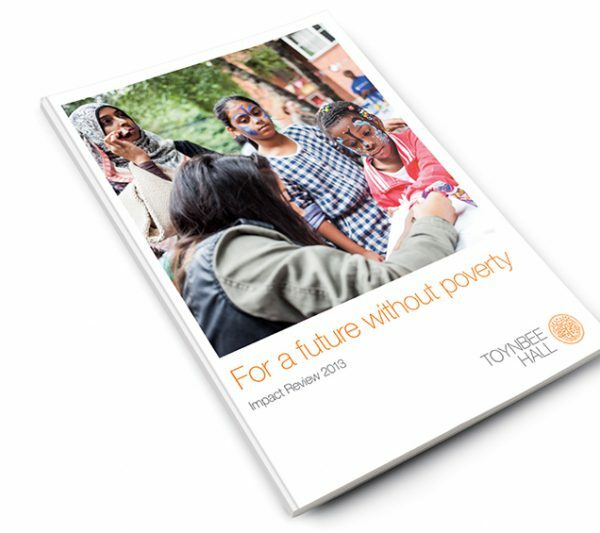 Toynbee Hall asked us to help freshen up its brand and create an impact report highlighting how it’s going about tackling the problem of poverty that’s still so real in East London. It started with a brand session. We invited staff, volunteers and service users to take part, in order to help us understand what Toynbee Hall really means to the people who use it. We asked them well-considered questions that would start to draw out a sense of the unique qualities of Toynbee Hall, to give us an insight into their perspectives on the balance of their local and national work. Since we were working within a restricted budget, the session gave us a great idea of which areas to focus on. During the session we learnt that Toynbee Hall’s ‘tree of life’ logo, designed by C.R. Ashbee towards the end of the 19th Century, is much loved and stands as a symbol of heritage for the organisation. We agreed that the logo needed a sympathetic refurbishment, rather than a full reinterpretation. We redrew the logo in simple vector format and opened it up against a white background, allowing us to introduce a new dynamic colour palette. It also became clear that a library of photographic images was high on everyone’s list of priorities. So we commissioned and art-directed a shoot to capture images of real people in real scenarios. Rather than shooting stark or depressing images, we looked for the warmth of the personalities and interactions at Toynbee Hall and in the surrounding community. While we were there, we commissioned and edited a series of short films that delve further into Toynbee Hall’s story and support the impact report online. The result is a set of images and videos that tell a story powerful enough to help them take on poverty and inequality on a wider social scale. The deep margins and simple typographic hierarchy create a brand language that is open and accessible, allowing the photography to take centre stage. 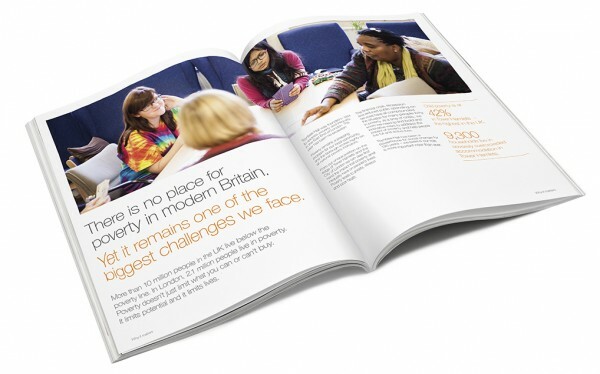 Toynbee Hall doesn’t just work to alleviate poverty in its local area. Its legacy of experience makes it influential on national research and policy. With this in mind, we developed a bold, contemporary and credible voice for the organisation, clearly establishing their knowledge and authority while remaining conversational in tone. 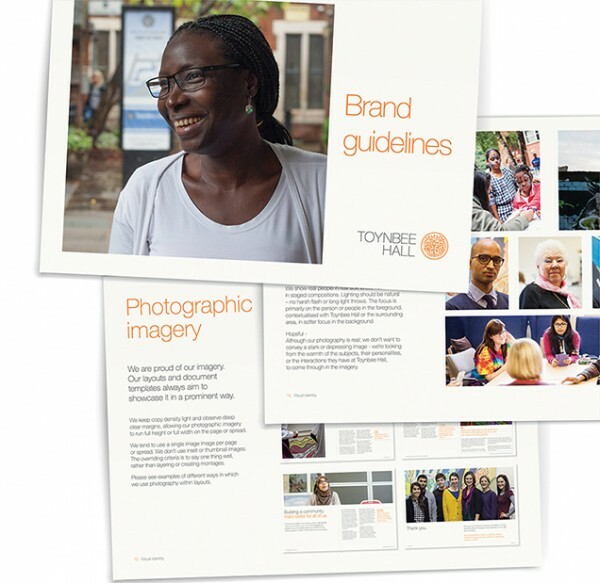 We delivered the brand refresh and impact report with a set of guidelines and document templates so that Toynbee Hall’s in-house communications team can work with their new identity independently.